A collection of spirited, wry reflections on aging, literature, and America’s moral life, taken from the blog of speculative fiction icon, and one of America's greatest living writers, Ursula K Le Guin. Ms. Le Guin’s brilliance lies beyond nomenclature. Few writers have been so conscientious of the ways that societies are defined by the nuances and omissions of their language ... This delightful book, inquisitive and stroppily opinionated in equal measure, assembles stray pieces from her recent adventures in blogging. Despite her reservations with the hideous word 'blog'—which sounds like it should refer to 'an obstruction in the nasal passage'—she takes to the digressive form with ease, ruminating on the value of literary awards, the Great American Novel (her pick may surprise you), the 'existential situation' of old age and her outsize love for a newly adopted black-and-white cat called Pard. In even these miscellanies, composed in her off hours, the sentences are perfectly balanced and the language chosen with care. After all, she writes, 'Words are my matter—my stuff.' And it’s through their infinite arrangements, 'the endless changes and complexities of their interrelationships,' that Ms. Le Guin’s extraordinary imaginary worlds have been built and shared. ...feels like the surprising and satisfying culmination to a career in other literary forms ... A running theme is the life of her cat, Pard. Between each of No Time to Spare’s four topical sections are essays entitled 'Annals of Pard.' Devoting such time and interest to the observation of a cat might seem to represent the commonest impulses both of internet culture and old age; but, as always, Le Guin wades into her new genre to deepen and expand it...Even in the familiar relationship of an old woman and her cat, Le Guin finds an ambit for challenging moral insight and matter for an inquisitiveness that probes the deep time of evolution. She represents an artist unimpeded by old age or acclaim. She continues to look for new sources of otherness in her life, and to give us glimpses of the otherness she inhabits ... even in a diminished form of writing, the spirit of Le Guin’s work remains. The new book is a well-selected record of her electronic musings and a masterful lesson on the importance of the practice of writing. 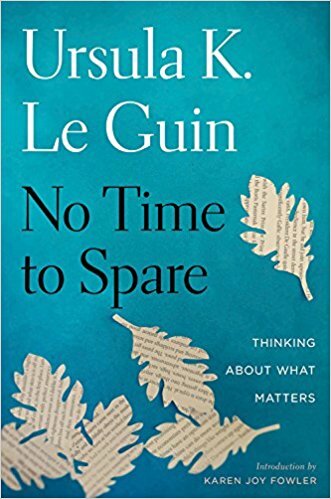 Le Guin finds inspiration in the everyday and makes it sparkle with her prose ... Le Guin, in step with her legacy, challenges us to reconsider what we automatically accept ... But what resonates throughout No Time to Spare is Le Guin’s unwavering belief in the power of art — literature in particular — as the vehicle to imagine an alternative to our current reality. What did you think of No Time to Spare?